This unique design separates products from intermixing until just before use. Other designs use a peel seal type of material, where the user squeezes the package to mix the contents. This process can result in inadvertent mixing of the products during shipping, caused by the weight and bouncing motion during shipping and storage. 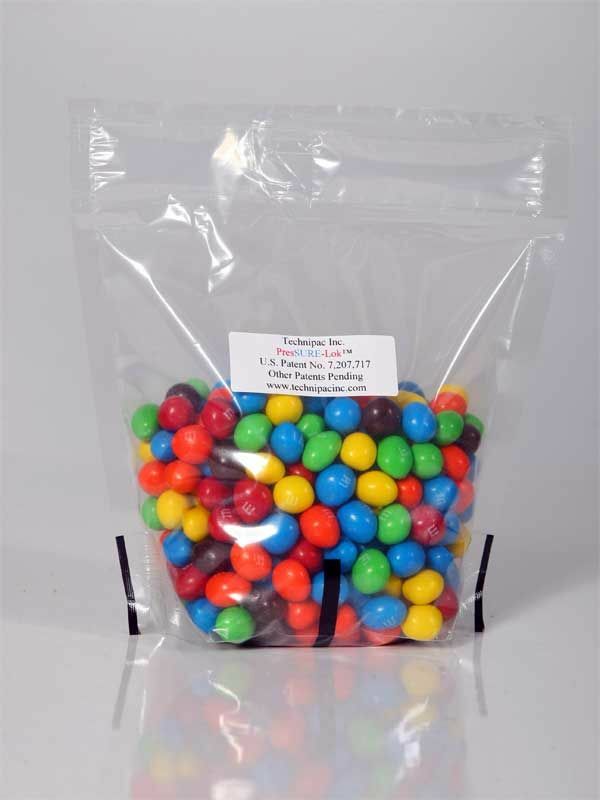 Our package requires the user to physically grab the front and back pouch panels by an easily accessible fin or tab and pull the panels apart to mix the products. 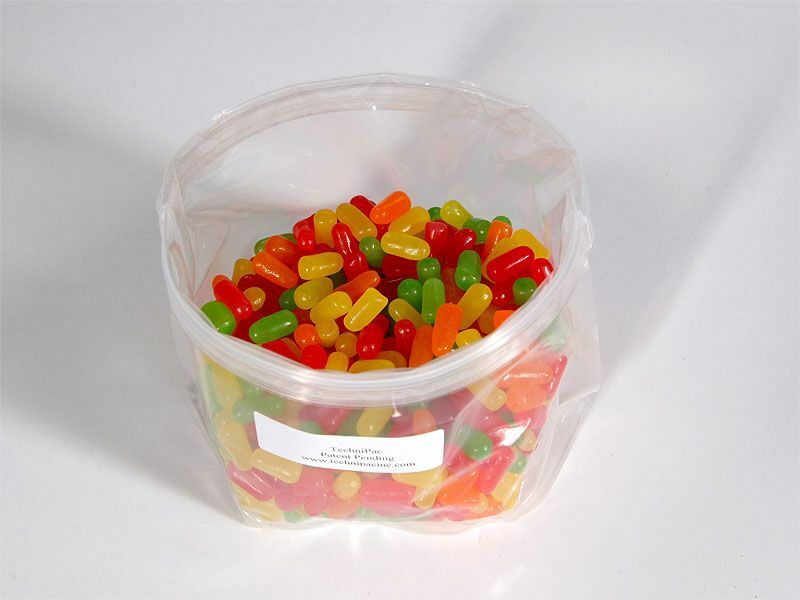 Typical pressure from stacking the pouches or shipping them will not inadvertently open them. 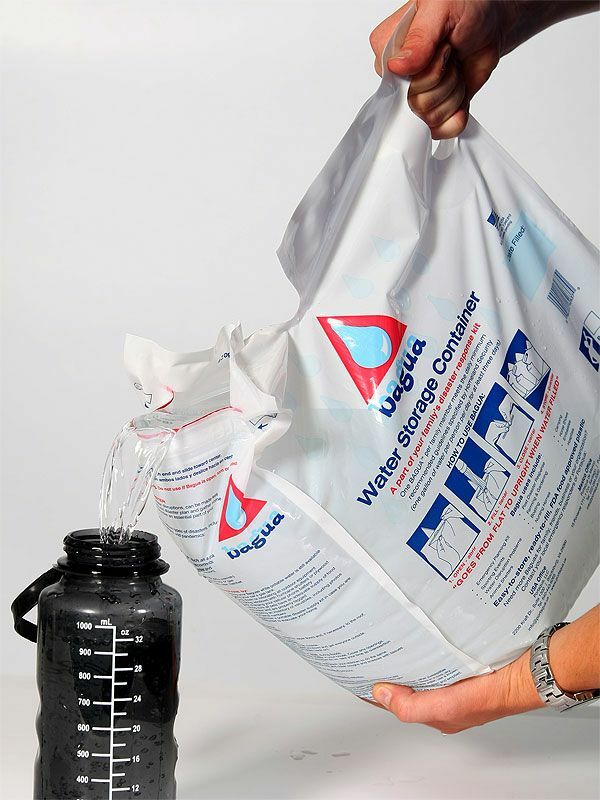 The Mixing Pouch can be used for liquid as well as dry products. 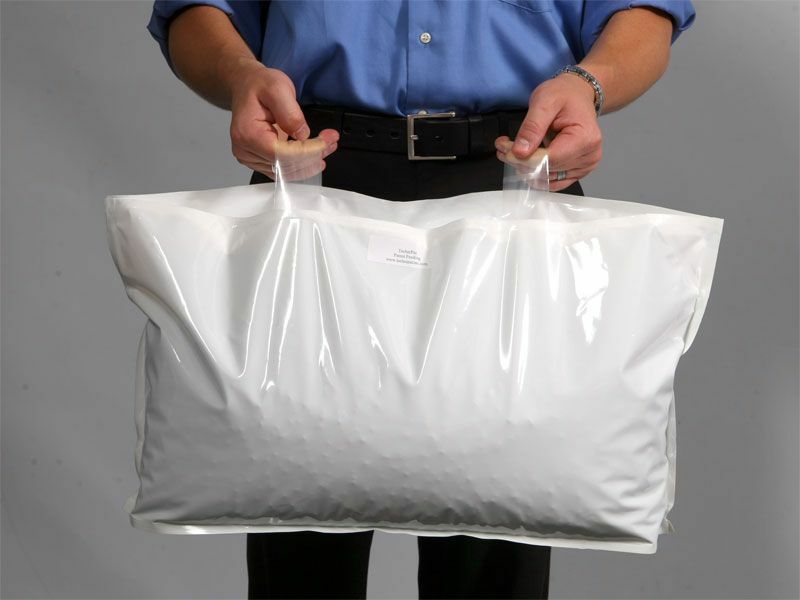 Many other large pouches have single handles for the consumer to use while carrying their product through the store. Single handles are cumbersome to use for manipulating the package in and out of the shopping cart or vehicle. Heavy packages are much easier to pick up and place when using two hands. 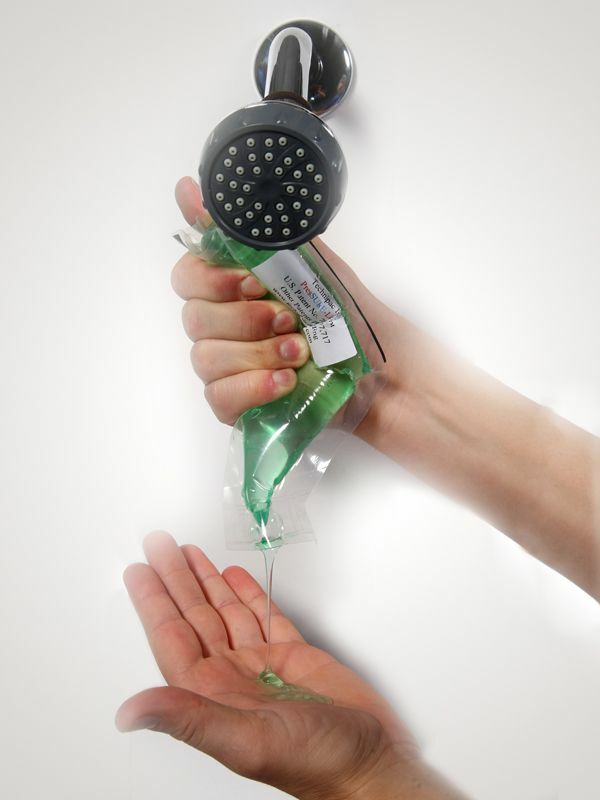 They also provide an easier way of pouring the product from the package. Possible uses include pet food, lawn and garden products, or any large format package. This pouch has two separate compartments, each with its own reclose feature. The front panel access allows the user to access the products without removing the top handle making this package convenient for every day use or travel. Some possible uses include complimentary products or market introduction of new products. 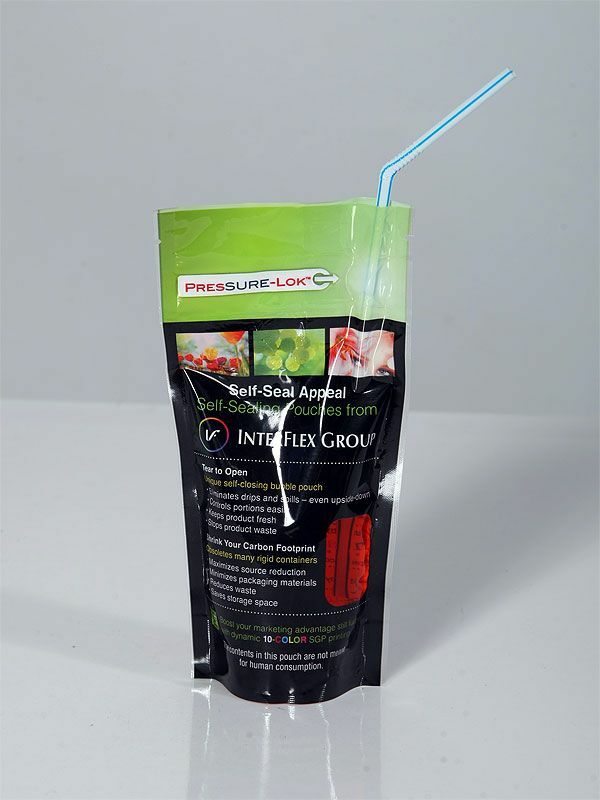 This pouch allows for a large ‘main compartment’ primary product and a lesser ‘small compartment’ product to be used with the primary product. Each compartment is opened separately so separation is maintained until combining the products is desired. The smaller compartment can also be made with the ability for the product to drop down and coat the primary product when introduced to heat during cooking. 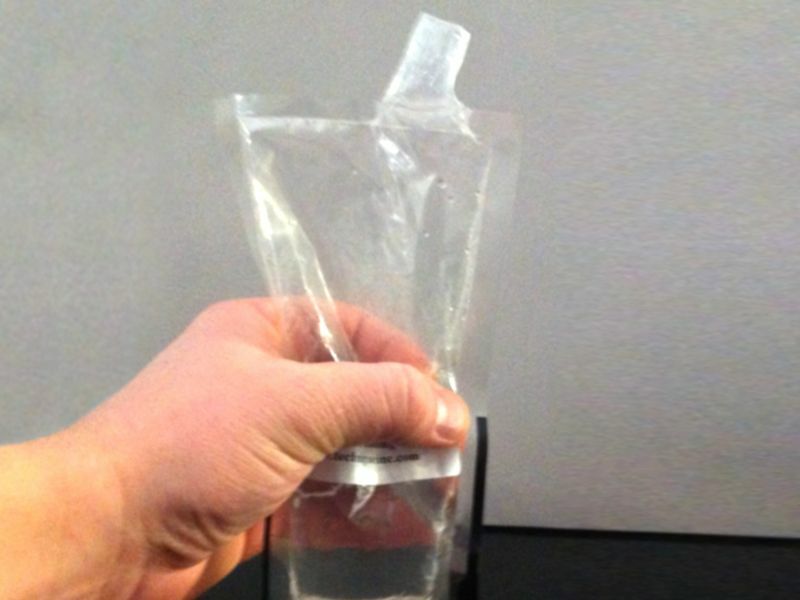 This pouch (patent pending) has an internal nozzle or spout built into it where it can remain free from outside contamination until the user wishes to access the product. 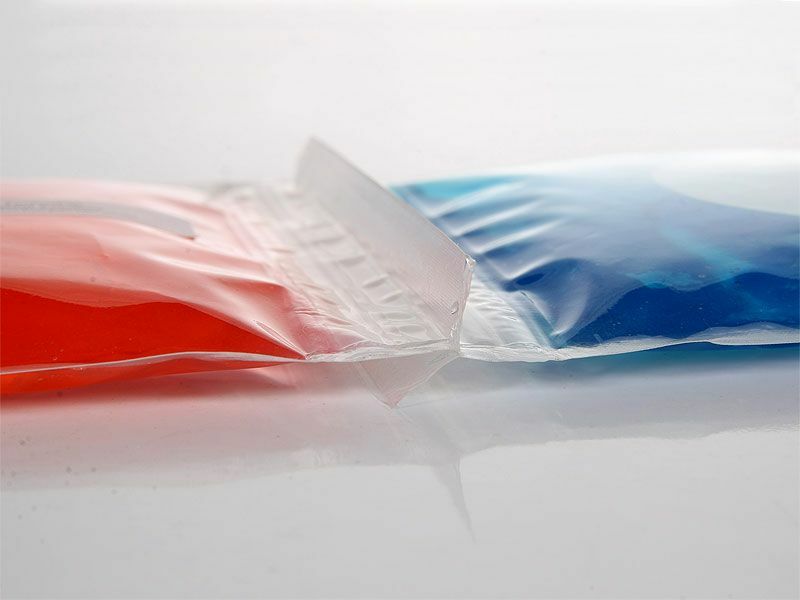 More and more liquids and flowable foods are being packaged to be consumed directly from the pouch. Rigid fitments are extremely expensive and produce a large carbon footprint. For these reasons, some products are using pouches without these features, which introduces another concern of putting a contaminated pouch into the user’s mouth. 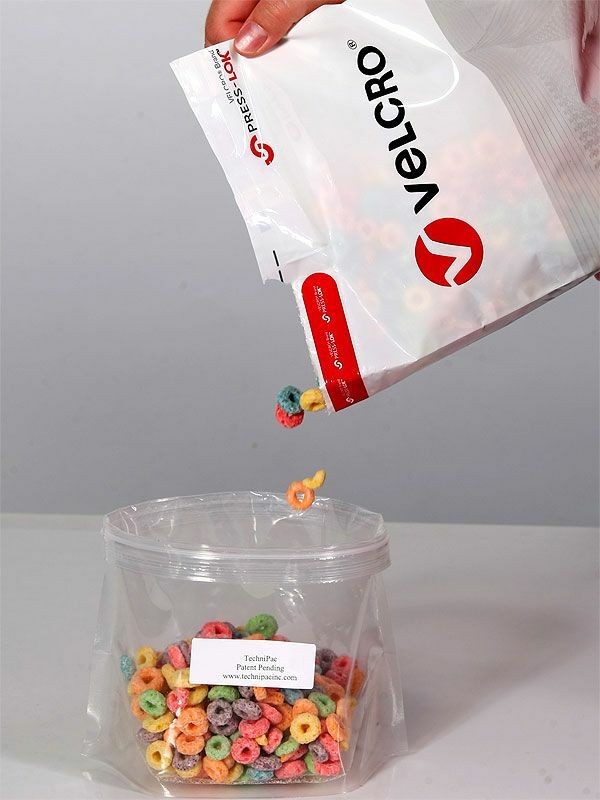 With this new revolutionary idea, the user simply removes the top seal from the package and then squeezes the pouch which allows the nozzle to move from inside the pouch to outside the pouch, where the sanitary nozzle can be placed in the user’s mouth for dispensing the product. This unique design and method (patent pending) allows the user to turn a pouch into a bowl, with a large, round opening at the top for easy access. 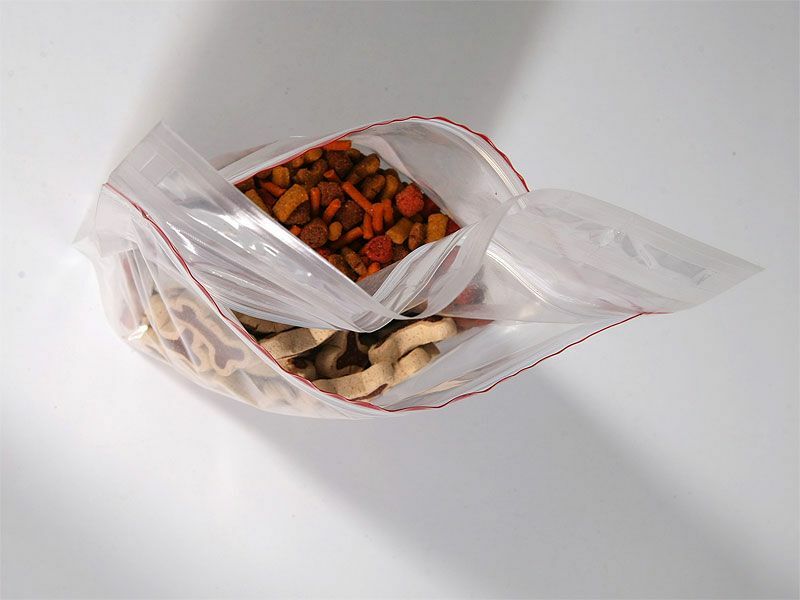 This pouch has many potential uses including snacks, cereal, pet foods, or pet drinks. This unique method also protects the user (human or pet) from sharp corners while in use. When the user is done, the pouch is reclosable until later use. For shampoo, dish soap, hand sanitizer, hand soap, and many other uses. Whether you lay it on its side or hang it upside down, this pouch will not leak. Simply squeeze the pouch to distribute the correct amount of the contents every time. Great for the environment and a perfect replacement for blow-molded bottles. Reclosable PresSURE-Lok® The one-handed open and close feature! The balloon closure is easy to open or close by simply gripping and squeezing the internal balloon. Squeeze one side to open, squeeze the other side to close. This unique feature can also be designed to self-close should the user forget to close the package after use. Push a straw past the closure feature to access the product. If the product is not fully used, simply pull the straw out and place in your refrigerator until used again. Once the straw is removed the pouch can be tipped over and will not leak. 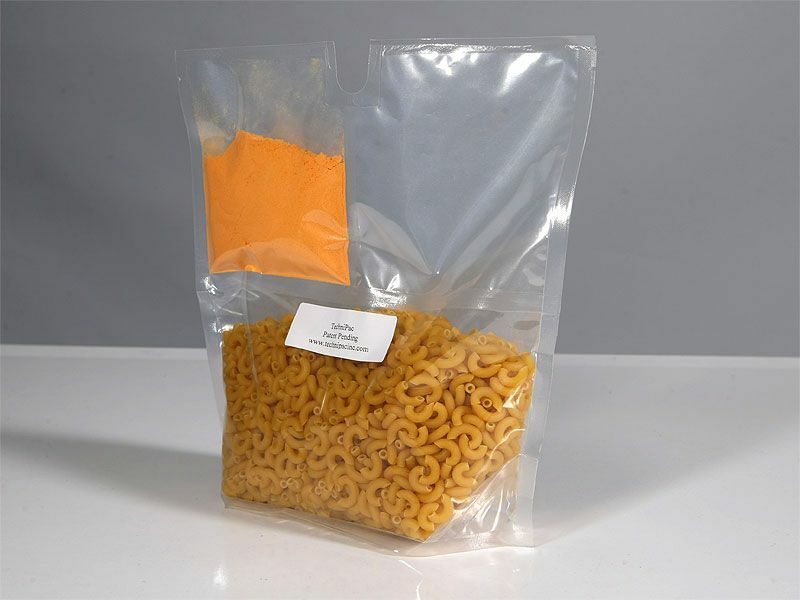 This unique package only requires a portion of reclosable materials which saves materials and costs. The closure is located in one corner which, when opened, creates a pour spout that can be reclosed after each use.